For now, eCommerce is definitely the most popular and lucrative business model. It’s a great thing for both famous brands and startups. Basically, with the help of the properly designed online shop, a user is able to enrich the audience of their company. You can attract new customers and work with people from all over the globe! Everything is simple and that is what makes eCommerce so popular. The second reason why today’s users open new web stores is that it doesn’t require a mint of money. You can sell online without paying a rent. In addition, having a website for the shop is a convenient step for your prospect as well. It saves their time and allows shopping without leaving a cozy bed. These are not all the reasons why we love eCommerce but it’s nice to begin with, isn’t it? As expected, now you would like to know how to manage a winning online shop. Before all else, there is one fact to be mentioned: no coding skills needed! Yes, in 2018, this process is absolutely code-free. And it does not mean that your online shop will be simple or primitive. You can construct a hi-res website of any complicity with the help of the newest ready-to-use themes from WordPress. Want some examples? 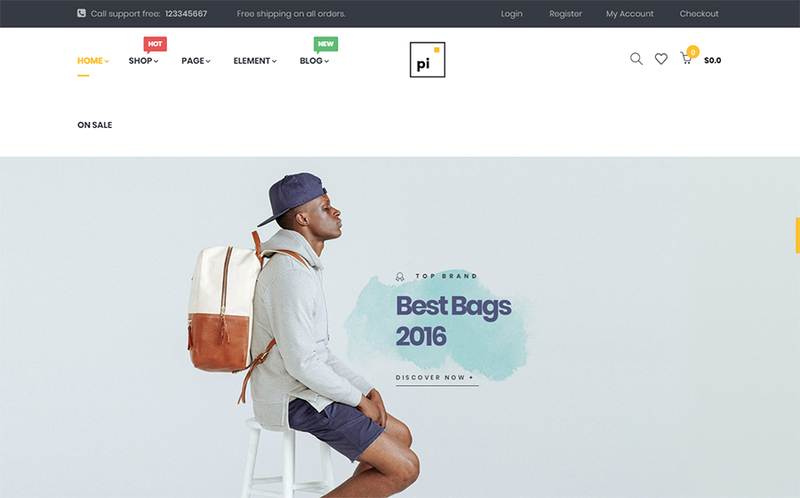 Here are 10 best WooCommerce themes we have found and studied for you. The template is intended to become the rock-solid foundation for a range of fashion-related eCommerce projects. A collection of 9+ home page layouts featuring unique styles and advanced sets of features is included for free access. The download package contains all tools and functionality that’s needed to build a usable and conversion-oriented web store. For example, the theme contains a usable MegaMenu, multiple product layout styles, detailed product pages, well-organized category pages, etc. The fully responsive layout of the template is intended to make all pieces of content accessible from different screen sizes. 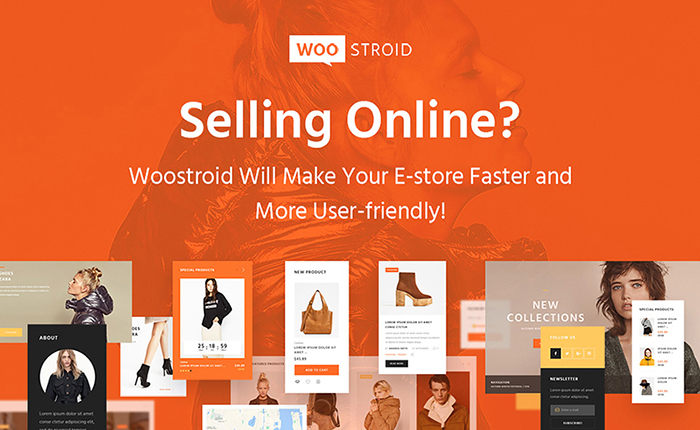 Without a doubt, anyone who dreams of building a WordPress based website, have already heard about this user-friendly multipurpose theme – Woostroid. It’s perfect for WooCommerce and contains multiple pre-designed skins and many ready-to-use design components for your online pages. Working with Woostroid, a user will be able to perform any changes to the pre-packed templates or create their own web pages easily. It’s possible thanks to a brand new website builder, which is based on drag-and-drop technique. 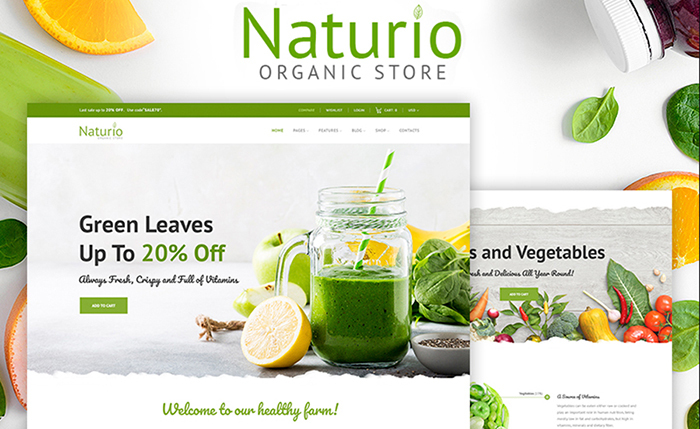 Before everything else, choosing Naturio, a user automatically gets the next ready-made web pages: several styles for blog, homepage, shop, (both product and product grid pages) contacts, team, etc. Needless to say, every page is fully editable, which means you will be able to customize everything and anything the way you need. No coding required, so the users of any skill levels can do their best in web design and eCommerce site building with the help of Naturio. Talking about the features, this soft WooCommerce theme for a modern food store site comes with the most popular drag-and-drop page builder, named Elementor. 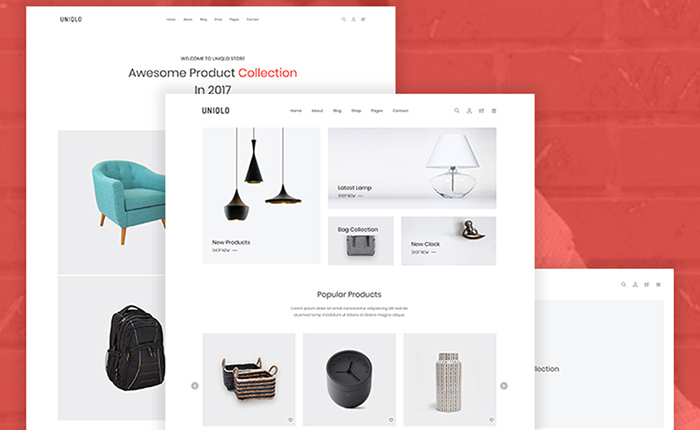 Using this multipurpose WooCommerce template, you will have no difficulty launching eCommerce sites selling fashion and beauty items. The easy-on-the-eyes layout of the theme’s pages is optimized for the flawless performance on all screen sizes. In addition to the pre-designed web store pages, the theme contains ready-made blog layouts. Running a blog will help you establish a better connection with your audience, as well as grow the visibility of your web store in the search engines. Detailed product page layouts, category pages, and 9+ home page layouts are included to be personalized in the way that matches your brand image ideally. If you open the recent statistics, you’ll see that the biggest part of all world traffic has been related to mobiles for years! That is why we recommend you to get a mobile-friendly design, as it’s a real chance to enlarge the audience of the online shop with no effort. When it comes to Fabulous, this voguish WooCommerce theme was created with a marvelous mobile-first design at use. In a word, the feature allows you to start selling goods pretty fast because the small-screened version of the web shop will be available when the big one is still under construction. Well, 4 flawless blog styles, 3 footer layouts, 3 header layouts, lots of free high-quality images, and power builder – these are just to name a few. Inside Bambino, there is a cool Live Customizer, which lets customizing the new and old online pages without trouble. With its help, a user will be able to perform any changes live, which means it will be hard to make a mistake. Finally, choosing Bambino, you get such must-have comfortable features as WooCommerce Quick View, Compare plugin, and, obviously, Wishlist plugin. Among these best WooCommerce themes, there is an inspiring product, which was made for sports related website creation. Choosing Certionix, a user gets a fantastic MegaMenu plugin that is very good for SEO and allows organizing your content is a professional way. To make a long story short, with the help of the plugin, you will be able to sort your items with categories and subcategories. No extra skills needed, so now you know an easy way to improve the navigation of a business online project. So, you want to set up a winning and popular online store and Garden has a real must-see feature, which brings you popularity. As expected, it’s all about Search Engines Optimization! The code of this creative WooCommerce WordPress theme was made to fit all the newest search engines requirements. For these simple reasons, any search system will notice your website rapidly, so here is how you can stand out from the crowd! By the way, Garden is also WPML-ready and allows you to cooperate with the search engines that work with the native speaking sites only. 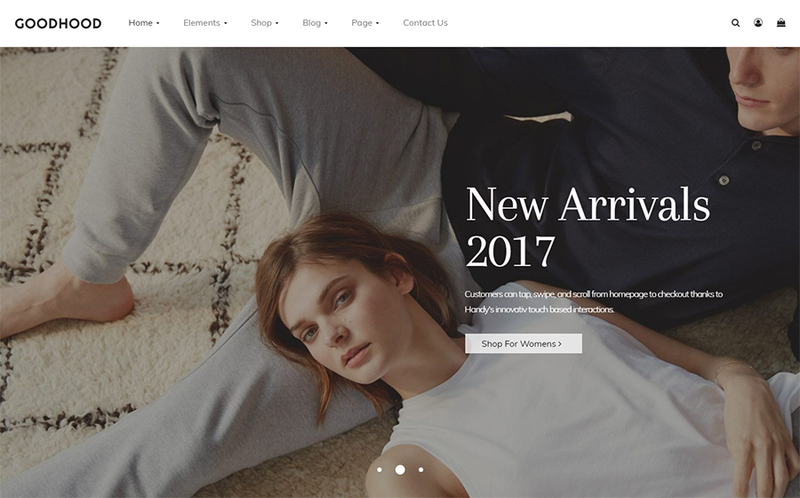 The multipurpose fashion WooCommerce template is built in the clean, flat style that is intended to keep the users’ attention focused on the essentials, i.e. the latest collections that you sell. 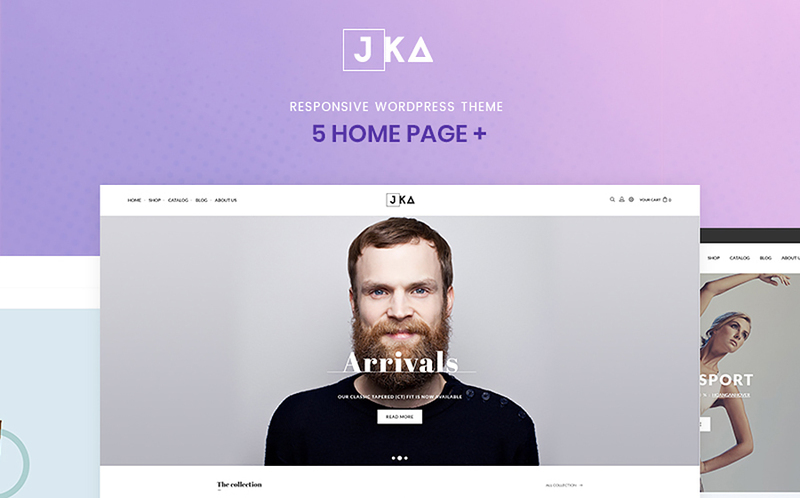 There are 6+ impressively usable homepage layouts included in the download package. All of them are built to be fully editable, making it quick and easy to bring the desired look and feel to the pages of your web store. 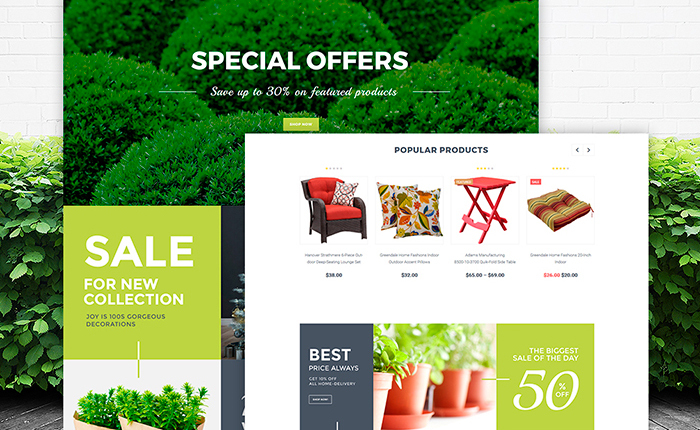 Multiple shop layouts, product pages, and layout elements are bundled for free access. The theme contains WordPress Live Customizer for the quick layout modification. Theme Color Switcher is included in the download pack as well. Ajax-based search and MegaMenu make it easier to find the necessary items on your site. We have already told you that it’s important to provide a comfortable navigation, so how can you make it even more visitor-friendly? To do it, we recommend you to remember one simple rule every website owner needs to know: always do your best to let a customer find whatever they are looking for! 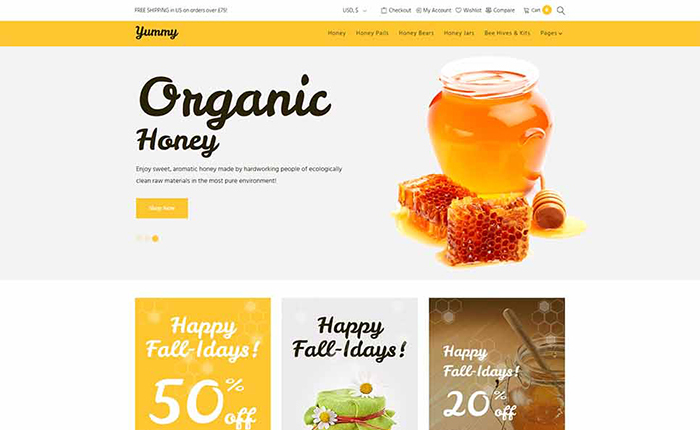 Therefore, we want you to use modern filtering system and Yummy is a great way to do it because this tasty WooCommerce theme has an Ajax based filter. It was created for eCommerce purposes and allows visitors to find an item by its features without page reload. 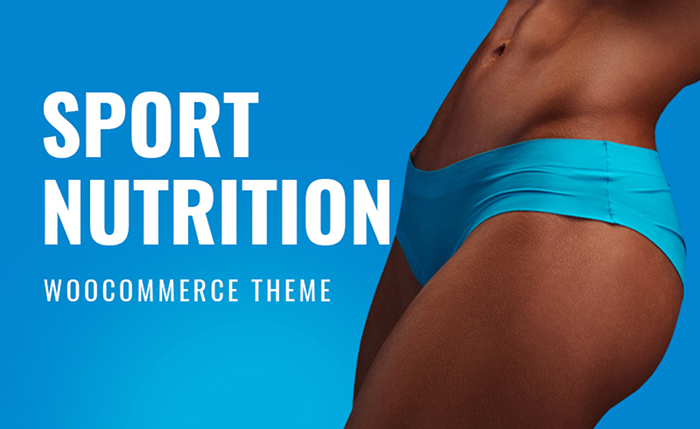 Among the features of this top-notch fashion and fitness cloths WooCommerce theme, you will see a wonderful bonus – free JetElements addon. This plugin provides the owner of Grand Discount with so many content modules and design components just out-of-the-box. As a result, using this ready-made product from WordPress, a user is able to make content diverse with many additional modules. In addition, let’s mention that Grand Discount (as well as all the best WooCommerce themes) has free tech support. In case you are looking for an all-in-one solution to set up an eye-catching business website related to sales, check Uniqlo. First things first, this WooCommerce theme comes with a minimalist design, which is totally responsive. For these simple reasons, you don’t need to worry about the appearance of the online shop because it will look great on any device. In addition, Uniqlo is also compatible with any browser, which means a prospect can enter your website anytime. Finally, let’s end our list of 10 best WooCommerce themes with this elegant and multipage template that is just perfect for building an online liquor store. 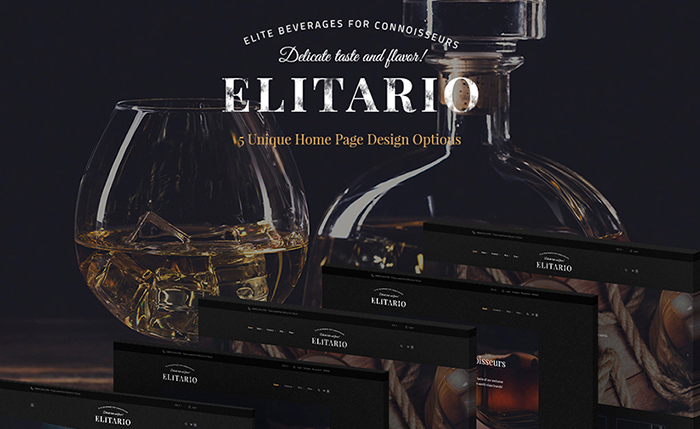 Elitario contains 5 different styles for the main page to choose from, 5 attractive blog layouts, outstanding plugins, bonus images, and much more. In the package of Elitario, a user will see Cherry Socialize feature, which will certainly help them to get social traffic. As you can see, there’re lots of things you get buying this gorgeous multifunctional WooCommerce theme. Thus, check the rest of them in demo! Undeniably, WordPress is a strong and popular platform. It develops and refines every day. Thus, you can open the gallery (we put the links above) to see all the trendy themes and templates that are powered by WordPress. Talking about the showcased products, each of them is user-friendly. Thanks to such features as easy-in-use admin panel and creator-friendly design, you can build the needed site without effort. Well, summer is here and we know that you dream of sleeping in the hammock somewhere by the sea… Still, today is a perfect day to lead your business to a new level. Are you ready to be upgraded?